"Aw hell, we played a rough game. We lost. I spent four years in the army...and eleven trying to get out of it." Other Stars: Pamela Reed, Christopher Guest, Nicholas Guest, James Whitmore Jr., Savannah Smith, Amy Stryker, Fran Ryan, Felice Orlandi, Harry Carey Jr.
Perhaps the most savage fighting unit in the entire U.S. Civil War, William Quantrill and his "Quantrill's Raiders" were a guerilla cavalry band that operated along the Kansas-Missouri border. Master of the lightning raid, Quantrill and his men would dash into enemy territory, pillaging and killing and terrorizing Union soldiers and civilians alike. Quantrill was eventually killed on a raid into Kentucky in 1865, but his legacy would live on after the War Between the States had ended. In the brutal era of Reconstruction that followed the war, Confederate-friendly Missourians were expected to swallow their pride as Union money and influence led a peaceful invasion of their homeland. Relying on skills perfected while serving until Quantrill, men like Jesse and Frank James and Cole and Jim Younger, along with others, turned to a life of crime, robbing the Union-backed banks and trains that found their way into Missouri. Perhaps no name in Western lore is better known than that of Jesse James. From their first bank robbery in 1866 to his death in 1882, the James Gang rode over the land in and around Missouri robbing banks, trains and stagecoaches as they pleased. Attempting to cover the history of James' exploits in a 100-minute film would be impossible. The Long Riders does not attempt to do that. Instead, we join the gang on several raids and see how they lived their private lives. Also central to the story is how they avoided the Pinkerton Detective Agency-led manhunt that sought to bring them to justice in the years leading up the climactic Northfield, Minnesota bank robbery of 1876. Over thirty films have been made about Jesse James. Such legendary figures as Tyrone Power, Roy Rogers, Audie Murphy, Clayton Moore, and Robert Duvall have played James since the first such film, Jesse James Under the Black Flag, was shown in 1921. As director Walter Hill is well known as one of the most meticulous men in Hollywood, it comes as little surprise that, by and large, The Long Riders is the most accurate screen adaptation of the James-Younger saga to ever grace the big screen. While Hill and the writing team, which included both Keach brothers, take certain small liberties with the historical record (many of which I have outlined in a spoiler-filled paragraph at the end of this review), he stays generally faithful to the events as they really occurred. The authenticity of the look and dress of the period, as well as Ry Cooder's fantastic original music, are spot on. 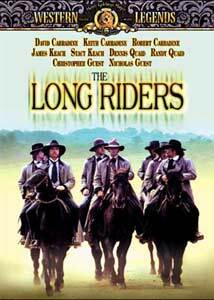 The Long Riders features one of the most notable casting gimmicks in the history of the cinema. Four sets of brothers play crucial roles in this story. These four sets of brothers are played by actual brothers! Jesse and Frank James are played by James and Stacy Keach. Cole, Jim, and Bob Younger are played by David, Keith, and Robert Carradine. Clell and Ed Miller are played by Randy and Dennis Quaid. Lastly, Bob and Charlie Ford are played by Nicholas and Christopher Guest. Even though this is certainly an interesting casting idea, and one that undoubtedly assisted in the marketing of the film, it really neither adds nor detracts from the quality of the performances. The Long Riders does not feature any Oscar�®-worthy standout performances but, with only a few sporadic exceptions, the work done by the actors here is more than competent. The Long Riders features plenty of content to keep fans of action-packed Westerns content. Be warned, however, that this is no light-hearted fluff when it comes to scenes of violence. Hill pulls no punches and I suspect that first-time viewers will find the film's violent climax both memorable and disturbing. The story line is compelling, albeit a bit rushed. Most films prior to this portrayed James as either a brutal villain or a Robin Hood-esque hero. This film avoids this pratfall and simply portrays him for what he was. The audience is left to make its own judgements as to the true character of Jesse James. It will probably not be an easy determination to make. SPOILER WARNING: The following paragraph discusses the few departures from the historical record that this film takes. If you have never seen it or are not already intimately familiar with the life of Jesse James, please skip this paragraph. Many of the historically misleading elements of The Long Rider result not from intentional historical "liberties" (an activity that Hollywood is notorious for), but from Hill's attempt to cover such a wide breadth of events in 100 minutes of run time. With no other knowledge, viewers might get the impression the events portrayed occurred within a relatively short chronology. For example, Jesse James was not actually murdered by Charlie Ford until six years after the Northfield raid. Likewise, Frank James did not turn himself in to Pinkerton agents until several months after Jesse's death. One might also be under the impression that the gang was a cohesive unit with membership limited to the James brothers, the Youngers, and the Millers up until Northfield. In fact, the gang had numerous other members who came and went. Jim Younger's membership, as an example, was extremely sporadic. Other smaller deviations from the historical record include: Archie, the half-brother, was a normal nine-year-old boy not a fifteen-year-old simpleton, Clell Miller was killed in Northfield (he did not die after escaping), the Northfield window scene didn't happen, Jesse was killed in the morning, not after an evening meal, and Frank did not turn himself in so that he could bury his brother. Image Transfer Review: This disc's anamorphic transfer succeeds in being little more than mediocre. While not overly obtrusive, The Long Riders features a fairly grainy print, especially where sky is visible. Colors tend towards muted. The print is generally clean, but where dirt and blemishing occur they are noteworthy and somewhat distracting. Shadow delineation is decent. Most disappointing, however, is the very lackluster level of clarity. Undoubtedly, the visual presentation is a huge improvement over VHS, but I was hoping for much more. Audio Transfer Review: The 2.0 digital mono track, an inherently disappointing format to begin with, is only average when judged against its peers. Very rarely does sound dip into the lower half of the sound spectrum. Highs are crisp, but sometimes tinny. Some volume level problems are present. Since the film relies heavily on Ry Cooder's wonderful original music, dialogue clarity is often trodden upon in scenes where it is utilized, as well as in some scenes that feature a lot of background noise. This film really deserved a remastered Dolby Surround track or better yet a 4.0 track, but is instead another victim of MGM's insistence on getting as many titles to market as quickly as possible. Such a shame. Extras Review: The Long Riders features only the film's theatrical trailer (nonanamorphic). In addition to featuring what is quite possibly the most extravagant casting gimmick in the history of Hollywood, The Long Riders is an effective, honest, and authentic look at the last years of one of America's most notorious criminal legends.